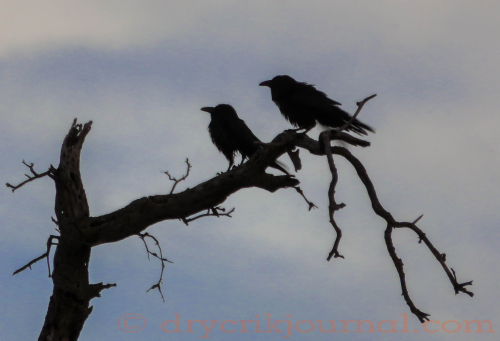 Crows are not my favorite bird as they kill other, smaller, birds nestlings. They will even eat the eggs before they hatch. They are fun to watch though and very smart. PBS had a very interesting show on them some time ago. They are amazing and very tough. We have found that if you kill one bird in the tree the rest will leave and never come back. They have a way of signaling danger to others of their kind. If they did not engage in destruction of other’s babies (Herod? Hitler? Assad?) I might enjoy them more. No avian genocide! on a hill above the canyon. In judgement of the day.